Amazon organizes Amazon Quiz daily from 8AM – 12PM and offers huge prizes everyday. By just answering 5 simple question, you can stand a chance to win that prize. In today’s Amazon Quiz, you can win an Honor View20. It’s a premium phone by Honor available at Rs 37999. It is packed with a Kirin 980 octa core processor and has a base variant with 6GB RAM and 128GB Storage. So, don’t miss out. 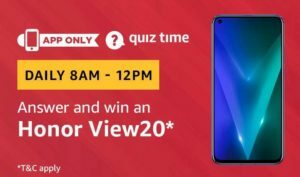 How to Answer and win an Honor View20? Amazon organizes Amazon Quiz daily from 8AM – 12PM and offers huge prizes everyday. By just answering 5 simple question, you can stand a chance to win that prize. In today’s Amazon Quiz, you can win an Honor Band 4 which nearly costs Rs 2999 on Amazon. So, don’t miss out on this free chance. 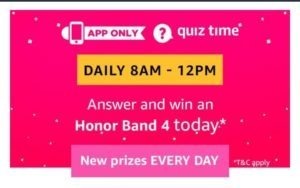 How to Answer and win an Honor Band 4? Loot lo!!! Amazon Great Indian Sale is live and there are plenty of products with huge discounts. 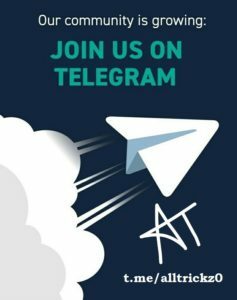 We are adding all best offers and deals in one single post. Apart from all the deals, there is one huge deal. Amazon is offering Honor Play (Navy Blue, 4GB RAM, 64GB Storage) at just Rs 12600. Yes, you heard it right. It’s currently priced at Rs 13999 and you can get additional 10% discount on HDFC cards. It comes with Kirin 970 AI Flagship Octa-Core Processor which is a premium processor and is seen in high priced phones. How to Buy Honor Play (Navy Blue, 4GB RAM, 64GB Storage) at just Rs 12600? 1. First of all, go to Product Page Here. Now, feel the power of all new Kirin 970 Octa-Core Processor on discount. 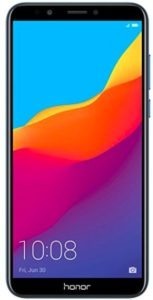 Buy Honor Play (Navy Blue, 4GB RAM, 64GB Storage) at only Rs 16999 on Amazon i.e. 23% discount. How to Buy Bose SoundLink Color II 752195-0400 Bluetooth Speakers at only Rs 8624? Great Indian Festive sale is live again. With almost same kind of offers, there are a few new offers which we will let you know. One of them being, discount on Honor 7c. It’s being sold at record low rate of Rs 7650 (Rs 8499 – 10% card discount). With exchange of your old phone, you can get more discount on this price. So, hurry up. How to Get Honor 7c in only Rs 3000?